Can You Exercise Without Losing Your Breasts? Contrary to popular belief, there is no diet, exercise or pill that controls where you gain or lose weight. According to the American Council on Exercise, weight loss affects all areas of the body that store fat, including breasts. Since the breasts are found on top of the pectoral muscles, certain exercises may help improve the appearance of breasts. Spend at least 150 minutes a week on some form of moderately intense exercise. Ride your bike, run or go swimming. For greater health benefits, the Centers for Disease Control and Prevention encourage adults to spend at least 300 minutes a week exercising. As long as your caloric intake equals your energy expenditure you will not lose weight or breast tissue. However, if you lose weight, you can expect to lose breast tissue. Toned pectoral muscles underneath your breasts can give the impression of larger breasts. Strengthen your pectoral muscles. Certain weight-bearing exercises, such as pushups and inchworms, help make your breasts appear to be more firm. To perform an inchworm, bend forward at your hips and place your fingertips onto the ground. Bend at the knees if you cannot reach the ground. Slowly walk your fingertips forward until your body is parallel to the ground. Perform a pushup, then slowly move your hands back until you reach the starting position. Perform three sets of 10 of each exercise every other day of the week. Use weights. Certain weight machines and exercises -- such as barbell bench presses -- firm up your pectoral muscles, which helps make your breasts appear larger and firmer. Grab a barbell and lie on a bench. Lower the barbell so that it rests just above your chest. Straighten your arms and push the barbell up into the air. Hold for one second, then lower the barbell. Perform three sets of 10 repetitions. Do not do chest presses, such as these, without a spotter for safety. 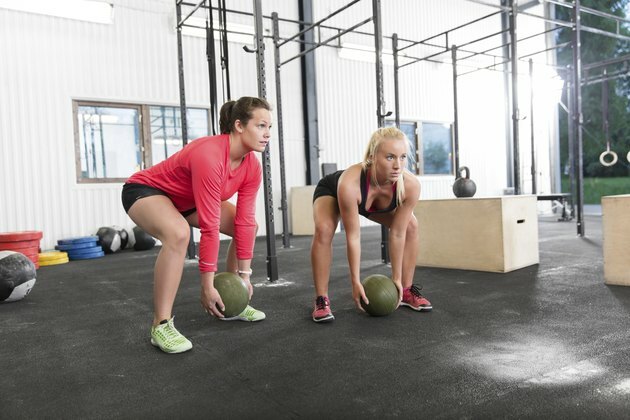 Grab a medicine ball and hold it in front of your chest as you perform a lunge. Throw the ball straight across to an exercise partner or friend. Perform three sets of 10 repetitions. Do front planks. For an instant chest lift, lie on the ground as if you're about to do a pushup, but instead of resting your weight on your hands, use your forearms. Bend your left knee as you bring it up to your chest. Pause for a second, then bring your leg back to the starting position. Repeat with the other leg. Do this sequence 10 times and repeat for three sets. If you have lost a significant amount of weight, you can invest in special undergarments and clothing that help enhance the appearance of your breasts, such as halter or fitted tops, corsets, padded bras and underwire bra cups. Or, speak to your doctor about surgical options. Wear a properly fitted sports bra when exercising. Intense workouts -- such as running, jump roping or aerobics -- may cause your breasts to bounce and the ligaments of the breasts to stretch and sag. Choose a sports bra that best supports your cup size and provides adequate support for the intensity level of your workout. Are There Exercises to Make Your Breasts Firm and Lifted? Do Push-Ups Make Your Breasts Bigger?